Spend One Day at Kuta Beach with Bali Local Driver. Welcome to Bali, today we will take you explore Kuta beach, as you start from Ubud, its need about 1,5 Hours drive accompanied by our Bali local driver, we will reached the Beach. Let me share a little bit about Kuta Beach. Most people in Indonesia may already know the name Kuta Beach in Bali, but most of them have never been to Kuta Beach or even to Bali. Kuta Beach is one of the most popular beaches in Bali with coastline reaches 3 kilometers which has been popular more or less since the early 1970. Kuta Beach is one of the tourist attractions in Bali which is located in the Kuta District, Badung Regency, Bali. Kuta Beach is famous as sunset beach and for Sun rise visitors can go to sanur. Based on information from Wikipedia, before Kuta Beach became a tourist spot, it first became a trading port where buyers from outside Bali bought local Balinese products. A Danish trader named Mads Lange founded a trading place in Kuta after his arrival in Bali in the nineteenth century. The kings of Bali and the Netherlands knew him very well because of Mads Lange’s negotiating skills. The book entitled “Praise to Kuta” written by Hugh Mahbett invites the Balinese to prepare tourist accommodation facilities. This book finally inspired many people to build various tourist facilities such as restaurants and food stalls, hotels and inns, entertainment venues and shopping centers around Kuta beach. In the early 1970s, Kuta Beach became very popular throughout the world, after decades before Sanur Beach had gained such popularity. Since that famous Kuta Beach, Bali has relied on this beach as a tourist attraction besides Sanur Beach. Kuta Beach is a beach located in Kuta sub-district, precisely in Kuta Village, which is part of Badung Regency in the province of Bali. Kuta Beach is on the west side of Jalan Kuta Beach. On the east side of the road is the location of shopping centers and famous Bali hotels such as Beachwalk Mall Bali, Hard Rock Hotel Bali, Mercure Kuta, Ina Grand Kuta, Best Western Kuta Beach, the stone, Pullman, Kuta Seaview and other cool hotels and shopping places. Kuta Beach is directly adjacent to Legian Beach to the north. While in the south, although it does not have a direct border, there is Segara Beach and next is Tuban. The location is not far from Ngurah Rai Airport, if it is not hit by traffic jams it only takes 10 – 15 minutes to travel from the Airport to Kuta Beach, If from the Ubung terminal direction to Kuta Beach, you can take a taxi or motorcycle taxi by traveling for 30-40 minutes traveling to the south. If you stay at Ubud, you may take local transport with 1,5 Hours drive, if you stay at Sanur, its take about 25-30 minutes drive to west. If you stay at seminyak area, you need drive via Legian, turn right then you will be at Kuta Beach. Kuta Beach is famous for its wave characteristics which are very suitable for surfing, especially the condition of the beach which is more dominated by sand without rocks, of course it will be very suitable for beginner surfers to surf on this famous Bali beach. International surfers often make Kuta beach their place of training and sometime held the surfing completion. To surf on Kuta Beach, anyone has the opportunity to try, because there are many surf boards rented by the local boy with various types and qualities around the beach. There are also many guides here, where visitors who are learning for the first time can use the services of a surf guide. 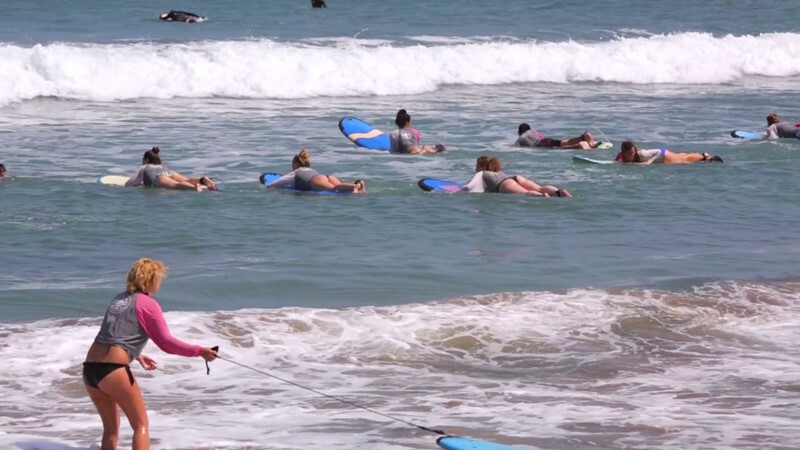 Or if you want arrange the learn to surf, there are some company has the learn to surfing program, one of those can see on this link http://prosurfschool.com. If you want bring book and reading all day, please rent chair and umbrella where you can relaxed reading the book and order some drink from the local boy. Another specialty of Kuta Beach is when the sea recedes in the afternoon before sunset, where there will be a vast and long stretch of white sand with exotic sunset views. Indeed Kuta Beach will look mediocre during the day, but you should not miss the atmosphere of the evening before sunset here. The scenery that will truly spoil your eyes, the atmosphere is also very suitable for walking around, playing sand, playing sea water, relaxed under umbrella, sunbathing , running and jogging or swimming at the safe area, please see the flag from life guard and ask them is it safe to swim or not. The waves on the beach are quite big, especially at high tide, so that small children who want to take a bath or take a swim really need strict guarding from their parents. Parents can direct their children to do other things such as making sand castles and bring toy to play around. If you want to swimming at the safe area, please see the flag from life guard and ask them is it safe to swim or not as we haves strong under current around this beach. The location of Kuta Beach is very strategic because there are various kinds of modern shopping centers, restaurants, hotels, small art shops, grocery stores, bars and all other tourist facilities. With its very strategic location, tourists from various countries who come to Bali often look for hotels and homestay near Kuta Beach so that it can be easier to take a walk every evening before sunset on Kuta Beach. Poppies lane 1 and 2 is famous spot for surfer to stay, as they can find cheap clean home stay, they also can walk shortly to Kuta beach as its location very close. The beach which was once the location of fishing villages has turned into a very famous tourist attraction and is always crowded with tourists from all over the globe. The beauty of this beach makes it often also the location of shooting for films, wedding photo, event exhibition or sometime you can see the group of people doing the team building. Waiting for the sunset moment on Kuta Beach is an interesting thing that should not be missed while on vacation in Bali. 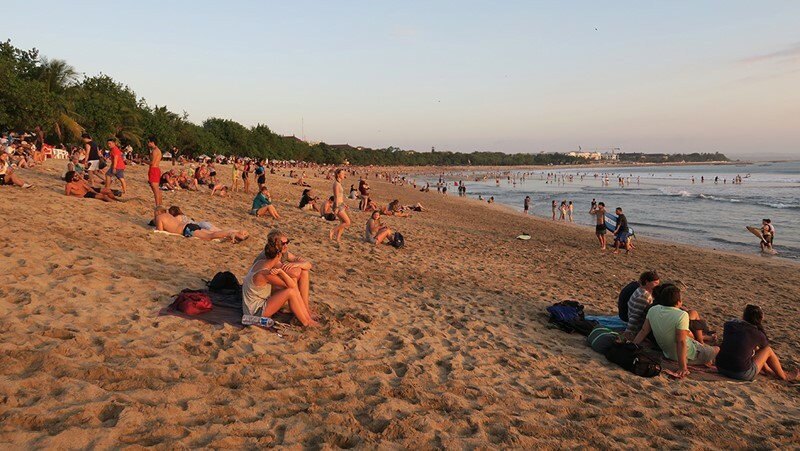 The twilight atmosphere on Kuta Beach with its famous sunsets everywhere, the vast beach sand area when the sea recedes, coupled with the extraordinary length of the beach. No wonder when sunset on Kuta Beach, so many people spill out here to wait the sunset moment on bright day. As a beach with wave characteristics that are very popular for surfers, of course we should not miss the opportunity to surf. We can many tourist from different country mix with local boy doing the surfing here, if you not a surfer why not try rent boggy board form the local boy with reasonable rate. You can do the jogging either in the morning or evening where the temperature not so hot, you may start the jogging from front of hard rock and jog to north till Legian , Seminyak, that is very long jogging will make really sweaty and you need break and grab some water from local seller around the beach. This activity may not be too attractive for domestic tourists, but for foreign tourists, this is one of their favorite activities while in Bali. Sunbathing is very preferred because it will make the skin look brown and also that indicate if they were in Tropic island of Bali. Sunbathing on Kuta Beach can be done by sleeping or sitting in a sun chair, on a mat or anything that can be stretched on sand or you may rent chair from the local. if you are lucky while visiting Kuta beach, Various religious ceremonies are often held at Kuta Beach by Balinese Hindus,which up to now are still held there at certain times. 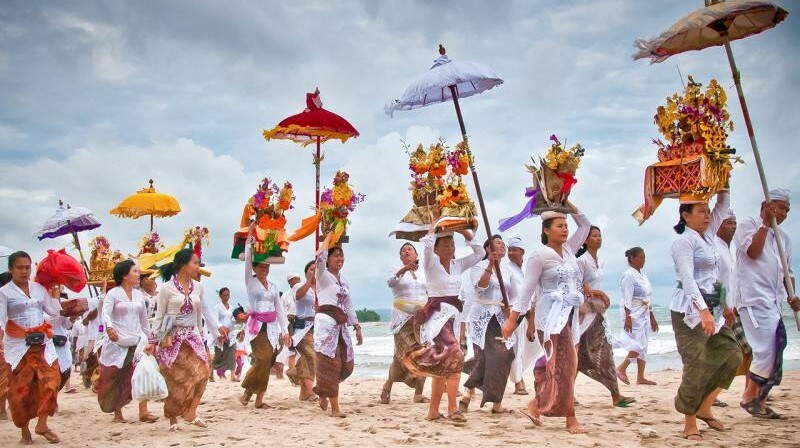 Some religious rituals that are often held at Kuta Beach include the Melasti ceremony or purification ceremony. Or On the Nyepi Eve, we can see a thousands of Balinese doing ceremony along the beach from Kuta to Seminyak, they will carry the Simbol of Gods from each village, normally procession doing in the morning, so bring your camera and you can do photography while visit Kuta beach. Other activities like making temporary tattoo from local boy can do on Kuta beach, other like hair braid, massage, pedicure manicure can do along Kuta beach.